PESHAWAR, Pakistan -- The aging man in mud-splattered, frayed clothes has barely lowered his body onto the sidewalk when the money starts piling up. Heeding his call for donations for flood victims, Pakistanis of all classes rush to hand over cash to Abdul Sattar Edhi, whose years of dedication to the poor have made him a national icon. He thanks each donor, some of whom ask to have their photo taken next to him. Four hours later, the crowd remains - and the equivalent of $15,000 is overflowing from a pink basket in front of him. Edhi has been helping the destitute and sick for more than 60 years, filling the hole left by a state that has largely neglected the welfare of its citizens. 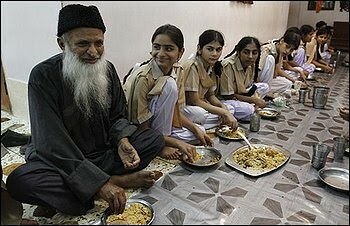 Part Mother Teresa, part Gandhi, with a touch of Marx, he is the face of humanitarianism in Pakistan. Funded by donations from fellow citizens, his 250 centers across the country take in orphans, the mentally ill, unwanted newborns, drug addicts, the homeless, the sick and the aged. His fleet of ambulances picks up victims of terrorist bombings, gang shootings, car accidents and natural disasters. Pakistan's corruption-riddled government acknowledges Edhi and other charities do the work that in other nations the state performs. The country has no national health service, insurance program or welfare system, and few state-run orphanages or old people's homes. The foundation offers an alternative to charitable work performed by hardline Islamist groups in Pakistan, some with alleged links to terrorism. The spread of these organizations has triggered concerns in the West, including their work in the aftermath of this summer's floods. Edhi is a devout Muslim, but critical of Islamic clerics in general, not just extremists. He says they focus on ritual, preaching hellfire and defending the faith against imagined enemies, rather than helping the poor - which he says should be the cornerstone of all faiths. The 80-something Edhi - he and his children disagree on his exact age - lives with his wife, herself a charity worker, in a tiny room in one of his welfare centers in Karachi, a bustling port city. His bed is a one-inch thick mattress on a piece of wood.